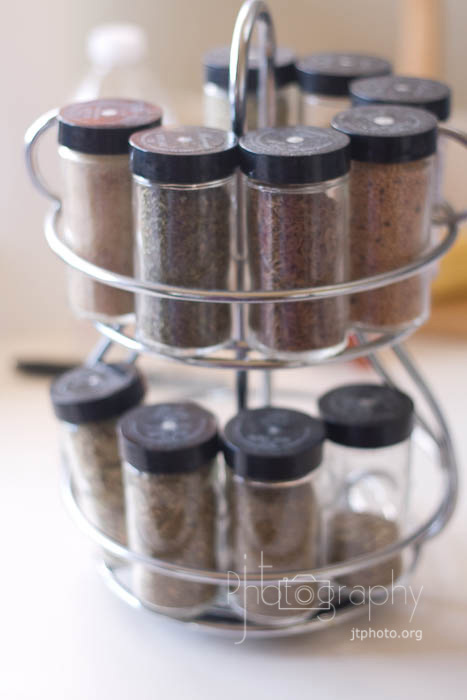 Do you have one of these (spice rack) taking up space, barely getting used? We got this for our wedding (almost 10 years ago) and have barely used any of the spices. The rack was on the top of my kitchen cabinets if that tells you anything. I did some research on spices to see how long I should keep them. I found out that if the spices have no fragrance when crushed then they probably aren't very good. Plus I had new bottles of spices that I used more frequently in my cabinet where I could actually reach them. SOOOO, instead of just getting rid of the spices, jars and spinning rack I decided to re-purpose the whole thing. I emptied the jars, washed them out, took off the labels and got to work filling them up with crafty goodness. Think, buttons, sequence, safety pins, glass beads, the options are endless really. 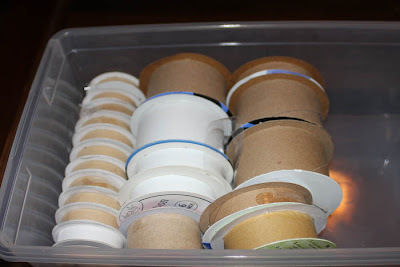 I sorted my buttons by color for the top jars and then added my little headband making supplies to some of the bottom jars. I added random little supplies to the extra jars and now I've got a great little spinning craft rack! I LOVE it and it's SOO helpful to me. No more dumping out the WHOLE jar of buttons just to find the right RED one, etc. I never really got a good picture of the "finished" product until I snapped this one with my phone while crafting the other night. It works great for me while making headbands and I don't even miss the spices that used to fill those jars! 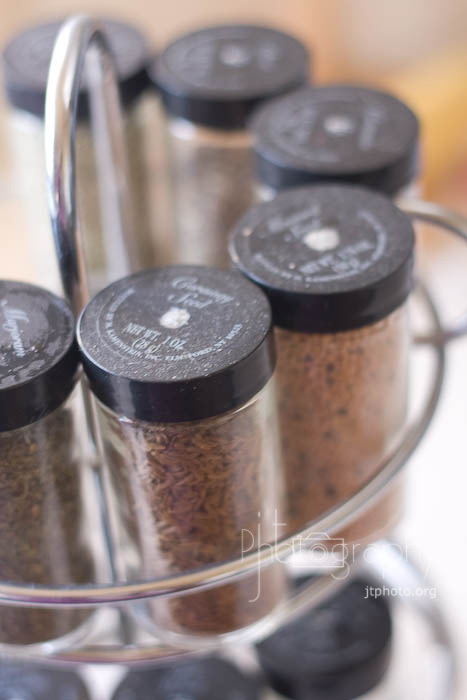 I know I'm not the first person to do this...just thought I'd share it so those of you who maybe haven't seen it can get to work re-purposing your old unused spice rack. 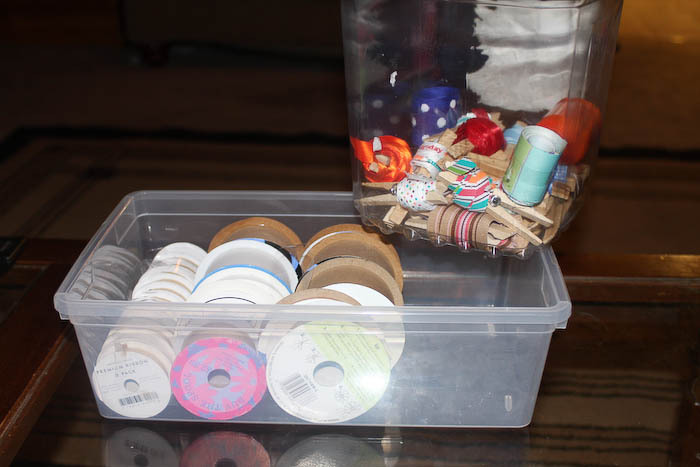 Think outside the box, there are lots of things that would make GREAT craft storage units!! 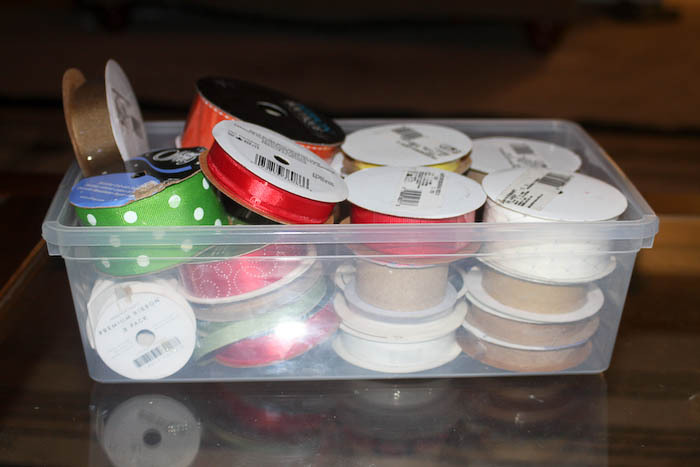 Do you have a crazy big ribbon stash? I know there are TONS of ways to store ribbons and I've seen a few lately that I really love...however, I don't have a lot of space so most of those cute, creative ways don't work for me. My craft "room" is a corner in my master bedroom and I already get in trouble for the amount of "stuff" I have so I'm trying to make the crafts disappear and not take up more room, or be displayed... someday maybe! 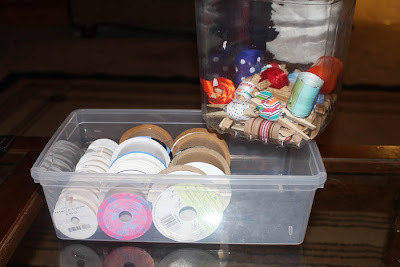 Anyway, I had all most of my ribbon spools stored in a clear shoe box. It worked for the most part but I felt like it was just taking up too much space. Again, this method of storage is not original to me, but I can't remember where I saw it the first time. 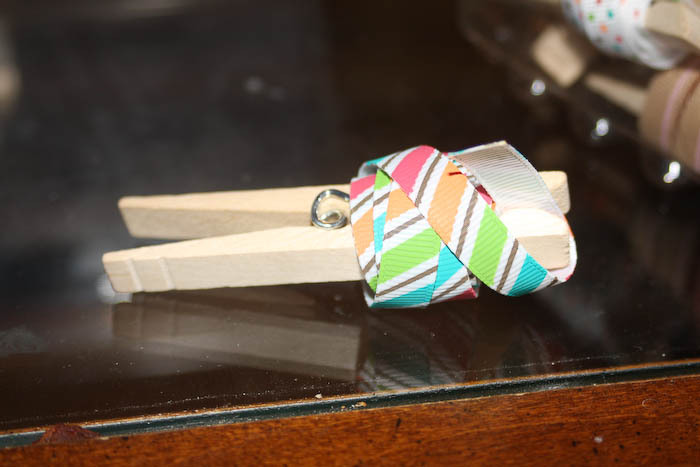 I took a package of clothespins and wrapped the ribbon around a clothes pin. 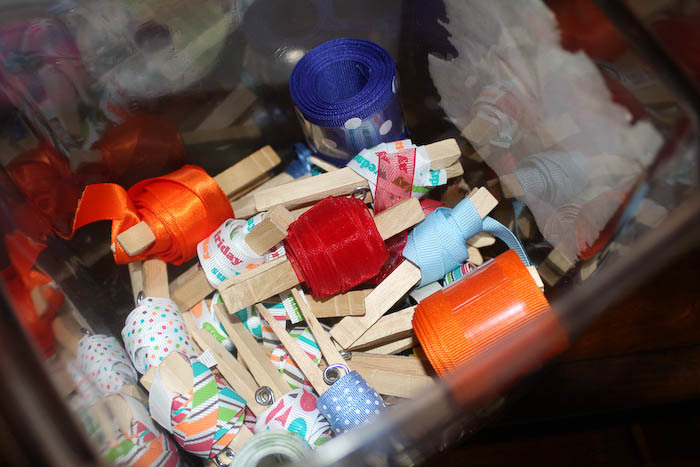 Clothes pins take up a LOT less space than those big cardboard spools do. 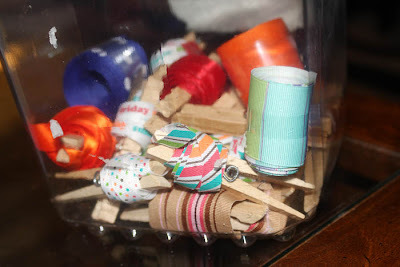 So I wrapped all my ribbon on the clothes pins and then put them in a large (emptied) twizzler bucket. They now take up 1/2 the space and I have a free clear plastic shoe bin to store other bulkier items in. 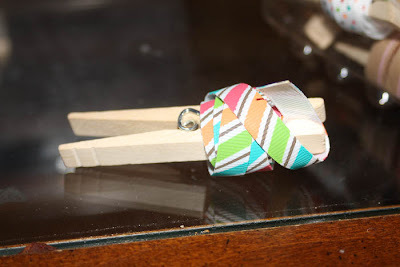 I need to get a few more clothes pins so I can get ALL my ribbon in one place but it works great and I can easily see and get to whatever ribbon I need!! Look at the difference in space that the ribbons take up. Plus, I think it looks cuter this way too! I would LOVE to see some of your craft supply organization...as I said before, I have a small space so I need some good space saving techniques!! PLEASE SHARE! Link up your craft organizational techniques in the comments!! Tomorrow I will be 32 weeks pregnant!! So excited to meet this new little lady...but SO much to do before she gets here! Hopefully the nesting will kick in full force once the big kids are in school and I have a little more time (and hopefully energy) to get the list accomplished!! I have the same spice rack and I put my buttons in them too! :) Love it! I've linked it before so you may have already seen it! I love to look at everyone's scrap rooms!